“People’s backyards are much more interesting than their front gardens” said the poet John Betjeman. And generally, I do have to agree. But I digress. Front gardens are your public face – the one by which others WILL judge you. I once had a very prim and proper lady in my class who, when we were discussing front gardens said in horror, ” Would you believe it but my slovenly neighbour allows leaves to blow into her porch and doesn’t sweep them up!” The rest of us all cringed in recognition, and I wondered if I could sweep my own messy porch before she left the house and judged me. The cobbled driveway was already there so we matched the stone setts and made a seamless join , making the new part match the old. Over the years that i’ve been designing gardens these are the principles that I find work for most front gardens. Of course, when I first visit a front garden it doesn’t look quite so ‘front parlour’- more of a ‘grungy squat’…… And one of my pet hates is not having planting against the house walls, like this: So bleak. The excuse often given is that the window cleaner wouldn’t like it. Well tough! The window cleaner will have to just manage. Beauty and softening the house walls is all-important! Tramlines in a differently coloured stone, as here, are another good thing in front gardens as they can be used to lead the eye to the front door. They also break up and add detail to otherwise unremarkable block paving. By the way, grey setts look very good with both yellow and red brick. On NO ACCOUNT use livid red pavours with red brick- very ugly! A ‘raw meat’ sort of look if you do. More tramlines to direct unsure postmen in this stylish Seventies house! 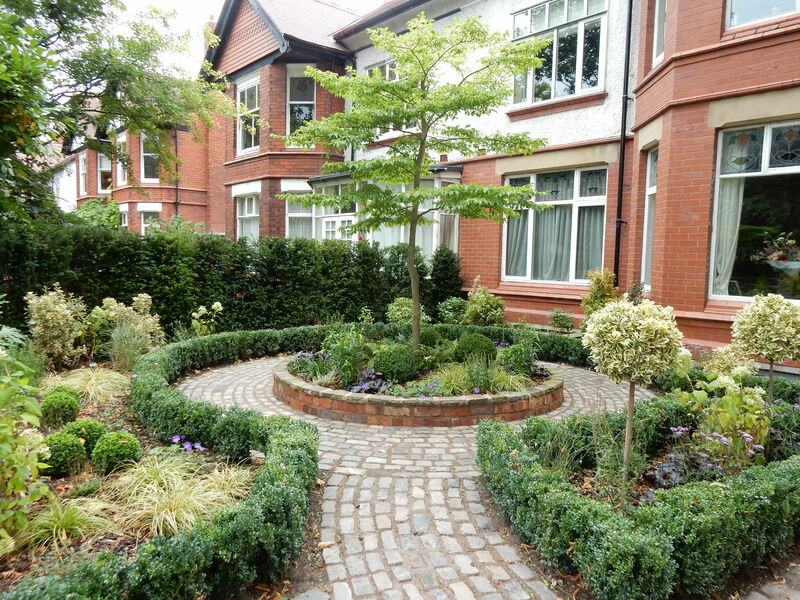 And another front garden with tramlines and lollipops and limited colours and evergreens all rolled into one! And then there’s a lovely gate (based on Prince Charles’s Highgrove gates- of course….) set within high brick walls covered in climbers- I wanted to create a sense of mystery and anticipation- what might lie beyond? It didn’t always look like this though- gardens never do when I get to see them first. But here’s the same view, before and after……. Looks very ‘front parlour’ now I think you’ll agree? So I hope your own front garden shapes up to the image you want to project to passing strangers- after all, they WILL judge you on it. Mine? Well why do you think it’s not featured here?! This is great! Lots of good ideas. I want to plant right up to the walls but I noticed no-one else does and wondered if that’s because it can damage the house? Hi Rachel, planting against the house walls with the usual fare of shrubs, climbers and perennials causes no damage in my experience. I’ve no idea why more people don’t do it! Thanks Anne! I really want to do that. I grew up in a house which had lots of plants against the front wall (including a winter flowering jasmine and a honeysuckle) and it looked great. A couple of people have mentioned window maintenance but I don’t really care about that because it’s not my job! Heh heh.